Previous estimates for the yield of investigations for GDD are broad (10%–81%).2 The variability may be due to differences in patient populations, clinical settings where tests are performed and the range of tests undertaken.2The last evidence-based UK guideline for investigation of developmental delay was published 10 years ago.8 With the advent of more recent techniques in genetics and a recent burgeoning of guidelines in other countries,4 9 10 there is a need to review our practice in the UK. The primary objective of this paper is to provide (1) an update of the latest evidence for investigation of GDD, (2) recommendations for investigations and (3) evidence relating to yield and cost from literature presently available. For this review, we discuss and categorise investigations into first-line and second-line tests and subcategorised them to genetics, metabolic and imaging. See table 1 for recommended first-line investigations to be considered prior to referral to specialist services. We show a flowchart and decision-making tree for investigations in figure 1. Flow chart for decision making for investigations for global developmental delay in young children. Comprehensive clinical assessment remains the core to planning investigations in young children presenting with GDD.4 8–10 Aetiology can be categorised into exogenous, genetic (non-metabolic) and genetic (metabolic).11 The diagnosis of exogenous causes includes teratogenic agents (alcohol and drugs); prenatal, perinatal causes (prematurity, infections); and social causes often best assessed by history but must not be assumed. An examination of the child’s developmental status in all domains (gross motor, fine motor, language, socioemotional and cognitive skills) using a recognised tool to provide a normative comparison should also be conducted. Repeated clinical/dysmorphology and developmental assessments over time are more informative than one-off assessments in planning investigations and management. Molecular karyotyping will not detect conditions where structural changes in the chromosomes result in no loss or gain of genetic material such as balanced translocations or inversions, ring chromosomes and low-level mosaicism.18 20 A standard karyotype is still required if such a disorder is suspected (eg, refractory epilepsy, if a family is known to have a balanced translocation associated with a phenotype, a history of multiple miscarriages or clinical features to suggest mosaicism). Syndromes caused by methylation defects (eg, Beckwith-Wiedemann, Angelman syndrome) or mutations in single genes will also go undetected unless specifically tested. Clinical syndromes can present with variable phenotypes, and children who have a normal aCGH and FMR1 may be best assessed by a clinical geneticist to ensure that the most appropriate and cost-effective additional tests are undertaken.22 Use of specific gene tests such as those for Rett syndrome (or its variants) or gene panels for ID has been proposed as second-line tests.4 There is an increasing number of panels and exome sequencing tests available for ID (UK Genetic Testing Network; http://www.ukgtn.nhs.uk) or private providers, but specialist services (clinical genetics or paediatric neurology) do most requests for these tests, although this is likely to change as mainstreaming of these investigations advances. A systematic review of literature by van Karnebeek et al identified 89 conditions presenting with ID as a major feature, which are susceptible to treatment. Of these, 60% could be identified by non-targeted urine and blood tests. Some of these conditions (eg, creatine transporter defects, mild homocystinuria, female ornithine transcarbamylase deficiency) can initially present as GDD alone.25 26 While individual treatable IEMs are extremely rare in the general population, the prevalence will be higher in the at-risk population. Hence, though small in number, these treatable causes of GDD have been the focus of the more recent US guidance, with recommendations that screening for IEM should be used in all patients with GDD of unknown aetiology.4 24 A list of tests with treatable conditions they identify is shown in table 2. MRI of the brain has been used selectively and non-selectively in evaluating patients with GDD. The diagnostic yield of MRI is higher when used in patients where GDD is associated with clinical signs such as abnormal head circumference (microcephaly, non-familial macrocephaly, rapid change in head circumference), focal neurological signs or epilepsy. Targeted imaging was hence advocated by previous guidelines.2 8 Previous studies have demonstrated abnormal results in targeted imaging in about 41% compared with 14% with non-selective screening.3 Recent studies continue to demonstrate higher abnormality detection rates when MRI is performed in patients with GDD with additional clinical/neurological signs.30 31 More complex MRI protocols (eg, proton magnetic resonance spectroscopy) are promising tools to investigate GDD and enable a non-invasive measure of brain metabolites such as lactate or white matter choline,32 but studies have so far failed to show an increased diagnostic yield,31 33 and hence these are best used as second line in selected patients. MRI is a more sensitive test and has no radiation exposure, making it a preferred choice over CT. However, all children under 5 years will need sedation or a general anaesthetic, which has a slim risk attached, and some children will need further investigations including a lumbar puncture. There is an argument, therefore, that children requiring brain imaging should see a specialist prior to imaging, if an anaesthetic is required. A child where there is concern about regression in skills should be referred for an assessment from a specialist in neurodisability or neurology. True regression is quite rare, but incidence can vary with ethnic background of the local population. It can be difficult to establish if there is true regression or if the child has an evolution of their static disorder. Sometimes a child with GDD can demonstrate pseudo-regression where the gap in intellectual abilities between them and their peers is widening or in a child with cerebral palsy (CP) who has rapid growth and who may experience a decline in the motor function. The development of epilepsy can also impact on cognitive or behavioural function, especially in those with pre-existing GDD, autistic spectrum disorder or CP. Some children with regression may have a stepwise deterioration in function associated with decompensation (often an encephalopathy). This clinical pattern points to energy failure, and mitochondrial disorders should be suspected. A full discussion about genuine regression is beyond the scope of this article. However, the recent progressive intellectual and neurological deterioration study (www.rcpch.ac.uk/pind) has provided excellent data about more common causes (box).34 Some disorders that cause regression may be amenable to treatment or be eligible for a treatment trial. It is important, therefore, that the general paediatrician should have an awareness of the presentation of these disorders. NCL, neuronal ceroid lipofuscinosis; PIND, progressive intellectual and neurological deterioration. Children that should be referred to a specialist in neurodisability or neurology are shown on table 3. Investigations should be individualised and targeted as they can be invasive (eg, LP, muscle/skin biopsy) or painful (eg, nerve conduction studies and electromyography) and are expensive and time consuming for medical staff and families. Children with regression may also be referred to the clinical genetics team where specific next-generation sequencing panels can be undertaken and, at present, considered for the 100 000 Genome Project (www.genomicsengland.co.uk/the-100000-genomes-project). Immigrant children are exposed to a combination of biological, socioeconomical, emotional and environmental adverse events placing them at higher risk of developmental problems. This includes malnutrition and disability from trauma, overcrowding and toxin exposure and loss of parents or trauma from lack of stability.35 Furthermore, children may have missed new-born screens and vaccinations and been exposed to infectious diseases. In these children, comprehensive clinical assessments should consider all these factors while planning individual investigations. Despite new advances in technology, particularly in the realm of genetic investigation, clinical assessment continues to be vital in guiding investigation. 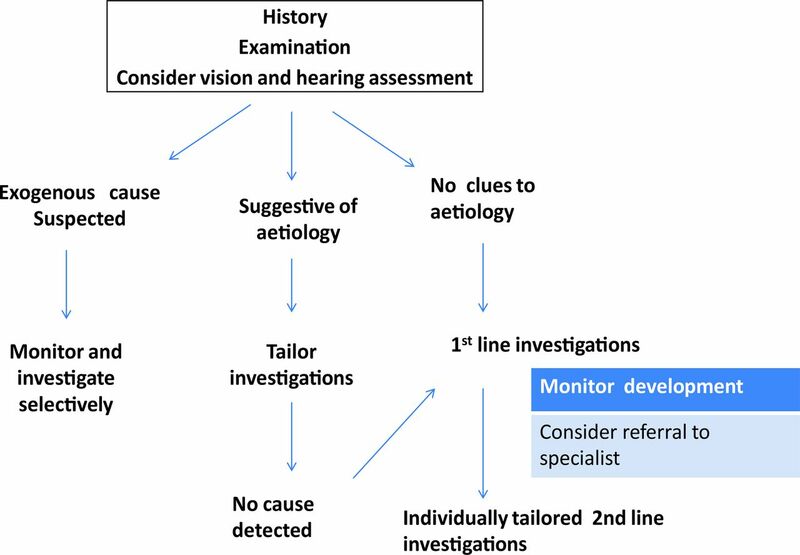 Clues to investigation may lie in the history and examination with clinical judgement being essential to enabling the right pathways to be taken in making a diagnosis. A good history can help direct which route to take in terms of investigation, particularly when exogenous causes are identified. Assessment over a period will provide clarity as to whether a condition is resolving, static or deteriorating. Assessment over time enables the phenotype to evolve and more appropriate targeting of investigations. It is clear that establishing a diagnosis enables us to answer questions on: why it has happened (aetiology), what does it mean for our child (prognosis), what treatments might be available (precision medicine) and whether it can be prevented in the future (prenatal testing and preimplantation genetic diagnosis). GDD and ID affect 2%–3% of the worldwide population with a lifetime cost of up to US$1 million.36 First-line metabolic investigations to identify treatable IEMs cost approximately $C568,26 with costs in Ireland for all first-line tests at €1335.10 Costs in the UK NHS laboratory for aCGH are not astronomical (£338–£350),37 38 with the majority of combined metabolic tests costing under £1000.38 Not all children will get a diagnosis and cost per diagnosis may be high, but there are obvious long-term cost savings if early diagnosis and treatment are possible. The options of genetic counselling and support for young families also make diagnosis invaluable. Recent advances in genomic medicine are transforming the investigation of children with significant developmental delay and are likely to transform the way we assess and investigate children. Traditional models of care have relied on history and examination with broad and then specific investigations to funnel down to specific diagnoses. The advent of rapid genetic testing and ‘omic’ medicine is likely to turn this paradigm on its head with whole genome/exome sequencing identifying genes, which may be causing the phenotype in an individual. The clinician will then use knowledge of their patient to make a judgement about whether this is the cause for their patient—‘reverse dysmorphology’. These advances in genomic medicine will lead to an increase in diagnoses that will modify how the individual is clinically cared for (precision medicine). The Deciphering Developmental Disorders study and the 100 000 Genome Project will both aid our understanding of disorders. We predict that, with time, whole genome sequencing/exome sequencing may become the first-line investigation of choice for all children with unexplained GDD and that other investigations will be secondary to this and used primarily for phenotyping. These will provide answers for families about the underlying cause of their child’s condition and will prevent further costly and potentially distressing investigations taking place. In this paper, we have outlined the present evidence and recommendations for both first-line and second-line investigations for GDD in children in the UK. We have provided new evidence relating to the use of genetic testing techniques and have demonstrated that this should be a first-line investigation for all children with GDD. Second to this, any treatable metabolic conditions should be always considered. With time, it is likely that the investigation of children with developmental delay will be turned on its head and we will be going from genetic diagnosis to phenotypic diagnosis. Despite this, history and examination will always be crucial for defining the condition and the change over time.
. Early intervention for disabled infants and their families: a quantitative analysis. Pediatrics 1987;80:650–8.
. Array CGH for learning disability - when is it worth it? : PHG Foundation.
. Testing criteria for fragile X syndrome: report of the outcome from the UKGTN fragile X workshop. London: UK Genetic Testing Network.
. Evidence-based approach to identify treatable metabolic diseases causing intellectual disability. 2011.
. Best practice guidelines for the biochemical Iivestigation of global developmental delay for Inherited Metabolic Disorders (IMD). 28-1-2013: national metabolic biochemistry network, 2013. Centers for Disease Control and Prevention (CDC). Economic costs associated with mental retardation, cerebral palsy, hearing loss, and vision impairment--United States, 2003. MMWR Morb Mortal Wkly Rep 2004;53:57–9. Great Ormond Street Hospial for Children NHS Foundation Trust,North East Thames Regional Genetics Service. Pricing, 2014. Community Children’s Health Partnership. Investigations for developmental delay: blood tests costs (2014) and what results could indicate? 2014.